GNA aligned forces triggered clashes with local militias near Zuwara’s Abu Kammash area on 5-6 January. The clashes ended on 8 January after an agreement was made over security arrangements for control of the land border and Zuwara port. On 6 January, the GNA affiliated ‘Kani brigade’ took control of the Garabulli coastal checkpoint before withdrawing. On 10 April, the UN released a report exploring armed groups control of prisons in Libya, the subsequent torturing of detainees and how successive government in Tripoli have been inability to curtail these activities. On 5 April, UNSMIL launched its first round of ‘consultative meetings’ in Benghazi and Zuwara, as part of the UN-initiated Libya National Forum followed by meetings in Ghariyan and Brak al-Shatti on 7 April and in Abu Salim on 10 April. On 26 February, the US imposed sanctions on several Libyan, Maltese and Egyptian firms, traders and ships reportedly participating in oil smuggling. On 23 February, the US and GNA signed an agreement to restrict the import of Libyan cultural property to the US. On 8 January, Government of National Accord (GNA) head Fayez al-Serraj met with UN Envoy to Libya Ghassan Salame in Tripoli to discuss the latest political developments in Libya. On 5 January, the German Foreign and Defense Ministries completed the destruction of components from Muammar al-Qadhafi’s chemicals weapons programme. On 6 October a militia affiliated with theLNA, expelled the Anas Dabbashi militia from Sabratha and Mellitah Oil and Gas Complex, with the approval of the GNA. Local communities who support the LNA victory are demonstrating against the Sabratha Municipal Council, and are demanding that the mayor to resign. On 14 October, Haftar gave a speech at a gathering of security officials in Benghazi, and said that it was unlikely that the UN led political path was the only way forward, instead implying that a military solution “approved by the people” remains possible. On 6 October, the Anti-ISIS Operations Room, a force friendly with both GNA and LNA authorities, announced its control of Sabratha after defeating the Anas Dabbashi Brigade following three weeks of intense fighting that ultimately left 39 people dead and 300 others wounded. HoR meeting to discuss the LPA planned for 9 October, was postponed after protestors blocked the building entrances. Various sources report that Libyan general Ali Kanna visited Algerian foreign minister Abdelkader Messahel in Algiers last week. Mayor of Zintan and other western Libyan municipal leaders met with members of EU committee as part of their campaign to partner with local authorities to implement stabilization programmes. Italian MOI met with Zuwaran local officials in Tripoli to discuss possible Italian support and cooperation regarding the migration issue. Anti- GNA militias mobilized south of Tripoli and deployed forces to various locations in preparation for a new operation in the capital dubbed ‘Libya Honor’ while Serraj missed a scheduled meeting with Haftar in Cairo. On 22 July, large demonstrations took place in Tripoli, Misrata, Zawiyya, Zuwara and others denouncing the discovery of French fighters acting in coordination with Khalifa Haftar as evidence of a French invasion, and breaching of the internationally recognized political agreement. Anti-Government of National Accord (GNA) forces are using the event to re-consolidate political forces that had fragmented after the GNA replaced the former Islamist-aligned General National Congress (GNC) in Tripoli on 30 March 2016… The credibility of the LNA took another severe hit after 14 bodies were discovered on 21 July in a rubbish dump in Benghazi, an area supposedly ‘liberated’ from ISIS in March 2016. 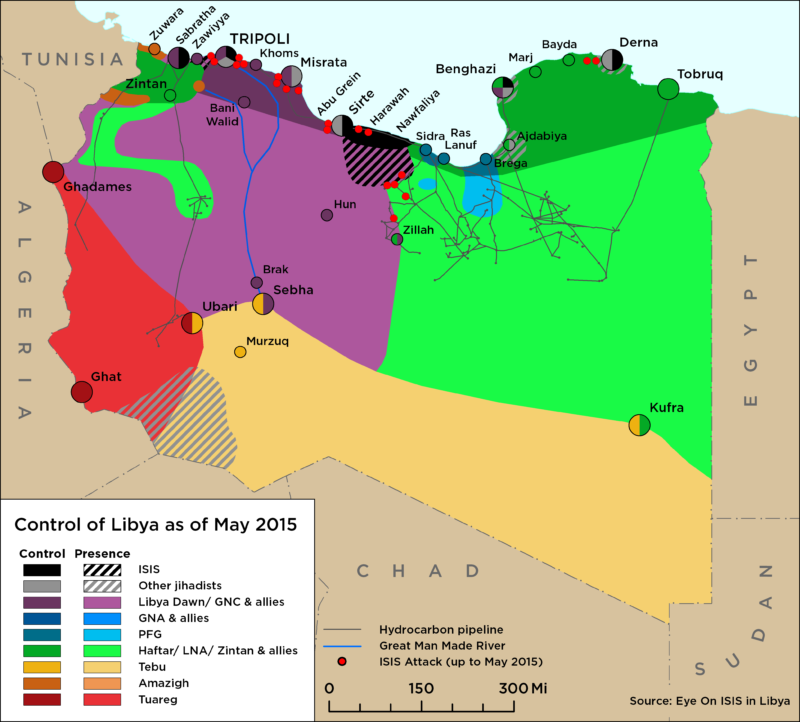 Over the last two weeks, the Benghazi Defense Brigade (BDB) advanced to within 60 kilometers east of Benghazi, before reportedly retreating back to its base in Jufra, Libya on 22-23 July. 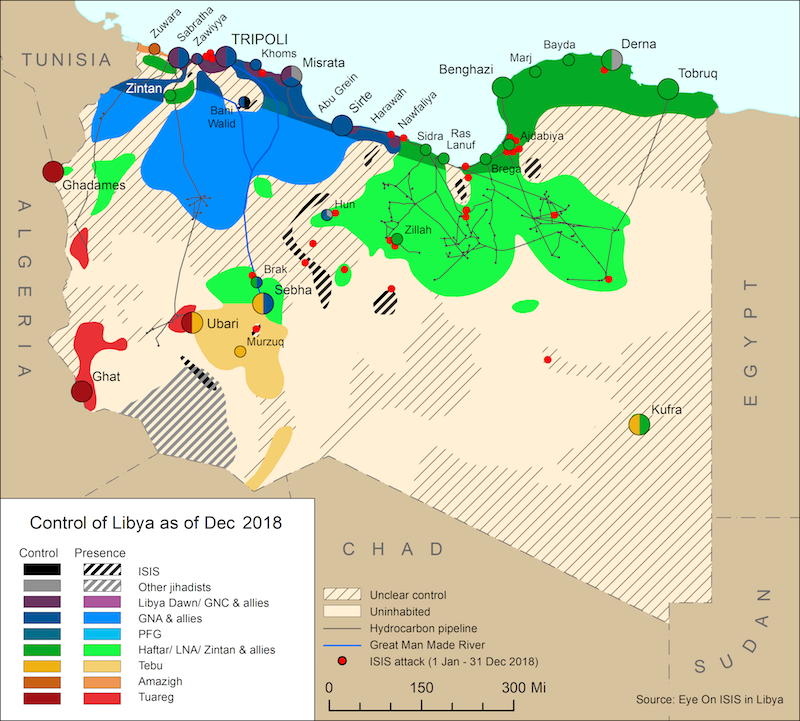 The militia, which has enjoyed rising support in western Libya after it managed to take down an LNA helicopter with three French soldiers onboard on 17 July, is likely to conduct a new incursion into the oil crescent to retake oil wells from LNA-aligned forces and to mount another assault on Benghazi. On 21 July, French President Francois Hollande confirmed three French special forces soldiers had died in the downing of a Libyan National Army (LNA) helicopter on 17 July. The event, and subsequent revelation, unleashed large demonstrations on 22 July in a number of western Libyan cities against France and the Government of National Accord, reinvigorating hardline Islamists and revolutionary factions as a force of opposition to both the GNA and House of Representatives. Kidnappings and assassinations struck Tripoli and Benghazi. The Foreign Ministry remained under siege and fighting continued in Derna.